I’m always on the lookout for creative ways to eat my veggies. Last week I was craving a salad without the traditional greens so I decided to make this chunky layered one with a Mexican flair. 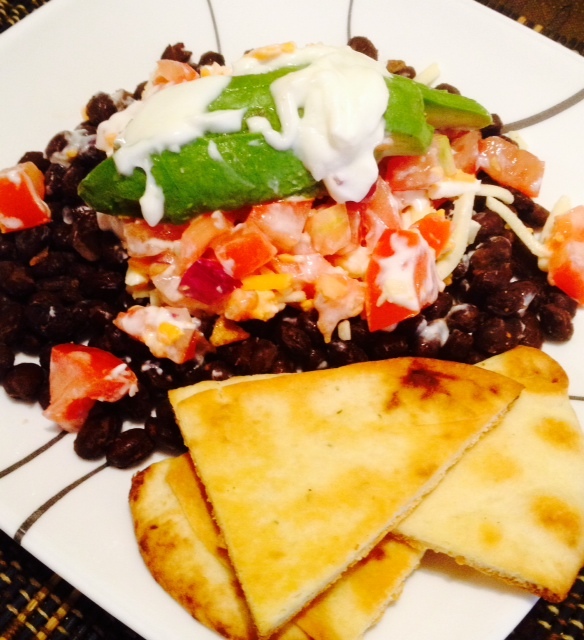 It’s really hearty from the beans and super flavorful from the Pico de Gallo and kicked up sour cream drizzle. I really wanted a few taco chips on the side for texture but we had none so I had to get creative. I pulled a naan bread out of the freezer, cut it into wedges and baked it. The edges get crispy but the insides have that little bit of chew that make naan so irresistible. The next day for lunch, I tossed the leftover salad together and ate it cold, which I loved. You could also just stir everything together in a big bowl and serve as a dip alongside a big plate of naan chips at a party or add a layer of taco spiced chicken or beef for the caveman in your life. Versatile, easy and super delicious…this one is a winner in my book. Combine chopped tomato, red onion, cilantro and salt in a small bowl. Set aside. Mix sour cream, lime juice and garlic salt in a small bowl. Set aside. Heat olive oil in small skillet over medium heat. Add garlic and sauté until fragrant. Add beans, cumin and salt and cook until warmed through. Place beans on a plate. Top with a layer of cheese. Top with Pico De Gallo, then avocado. Drizzle with Dressing. Serve with naan chips. Preheat oven to 400 degrees. Cut naan into wedges and brush lightly with olive oil; on both sides. Bake for 10 minutes or so until edges are crisp. Oh my this dish looks delicious! Thanks for sharing your recipe!